We experienced a few really hot days in Ireland. Many of us (including me) were tempted to lie down flat on the balcony/ beach/grass etc. to get some vit. D and a bit of nice golden tan. Do you know how to keep your tan for longer? If you are going on holidays to a hot country it is recommended to prepare your skin for strong sun beams in advance. Fake tan or tan-accelerating creams do not prevent sunburn. They do not induce your skin to produce melanin – a pigment that protects your skin from UV. 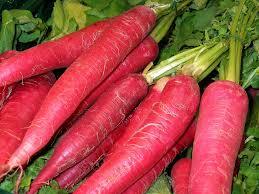 Red fruits and vegetables plus vitamin D do. 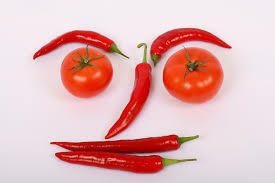 Even a few weeks before your holidays would be sufficient to boost production of melanin if your diet will be rich in carrots, red peppers, apples, berries, tomatoes, oily fish and eggs. for the absorption of calcium which is needed for bone health. High SPF (blockers) prevent producing vit. D completely. We avoid the sun between 1 and 3pm (in Ireland) when the sun is most intense. Even if you did everything to prepare your skin for the sun it is important to be careful and sun bathe in moderation. Avoid sun bathing at noon, take a siesta and relax in the shade, go for a swim to cool down your body temperature and drink looooots of water. Get rid of the dead skin cells before sun bathing. Your tan will be even and last longer. Scrubs with particles that dissolve over time like sugar or salt are gentler and do not irritate your skin (see our “Recipe for home-made exfoliant”). It is especially important after sun bathing. It is no secret; the sun dries your skin. It is important to moisturise it every day. Body oils are not new on the market, yet they do not have many proponents. I often hear that oils are not good for oily skin, because they will cause skin pores to be clogged. Yes and no. 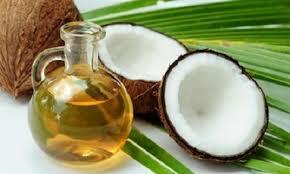 Mineral oils (petroleum – popular ingredient of lotions) have big molecules and therefore they are not absorbent. They stay “on the skin” and create a protective layer to keep moisture in the skin. They are not recommended for oily skin. 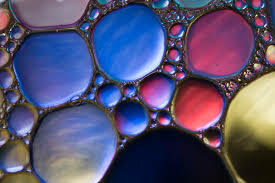 Plant-based oils (argan, coco-nut, sweet almond oils) have tiny molecules, therefore they are absorbent. Argan oil is the most absorbent from all the oils. Our skin will “drink it”. Plant-based oils do not leave the greasy film on the skin. Just remember to use them in moderation. Few drops on dry or wet skin will be plenty. Let them absorb for a few minutes. 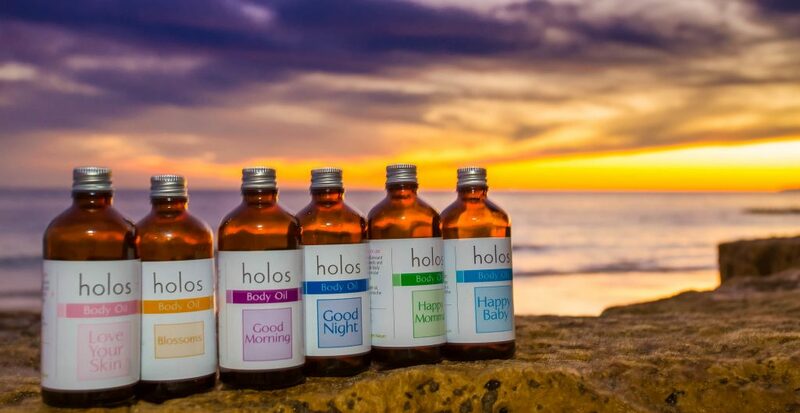 Holos body oils have a huge advantage over other body oils on the market. 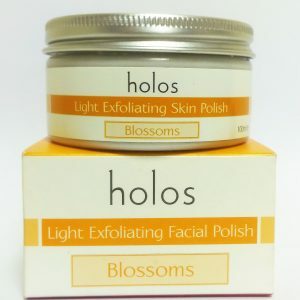 Holos combines high quality Sweet Almond oil with essential oils which have therapeutic properties. They smell divine and give you a lot of feel good. 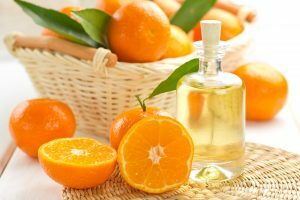 Good Morning with Geranium, Grapefruit and lemon – for oily skin or to fight cellulite – it improves circulation; you will also feel energised. Blossoms with Ylang-Ylang – very feminine, it is known for its aphrodisiac properties. Good Night with Chamomile and Lavender to help you calm down, relax and sleep. Happy Momma with Chamomile and Mandarin. Who said moms to be can’t enjoy healthy sun bath? Happy Baby with Chamomile and Lavender. The most gentle, nearly fragrance less body oil for babies bath or massage. Ideal for persons with sensitive smell sense, who can’t tolerate intensive perfumes or smells. Do not worry if you forget a hand cream or hair treatment on your holidays. Remember that Holos Body Oils are multifunction cosmetics. You can use them as a hair treatment, nail and cuticle treatment or to clean your make up off. Holos body oils do not contain SPF. Remember to use SPF relevant to your skin. Always start with higher factor and gradually decrease it. Owners of very sensitive skin and kids should start with sun blocker for the first two-three days.